Check out our Hours & Pricing here! Q: Are there ride restrictions? You must be 42 inches or taller to ride our waterslides and flumes. Q: Can I leave and re-enter? As long as you keep your wristband on, you may leave and re-enter the park. Q: May I bring food or a cooler? Yes, coolers and outside food are welcome. You may not, however, bring in alcoholic beverages or glass containers. Park personnel reserve the right to inspect all coolers for these items. Q: Are food and beverages available for purchase? Inside the Water Park we have a Poolside Bar & Grill where you may purchase pizza, sandwiches, hamburgers, chicken fingers, fresh smoothies, and ice cold drinks (both alcoholic and non-alcoholic). Q: What amenities are available inside the park? A bathhouse with restrooms, showers, and a changing area is available for use. Lockers may be rented to store your personal belongings. Q: Can I bring inflatable rafts and/or inner tubes? We do not allow outside inflatable rafts and/or inner tubes. Single and double inner tubes are provided. 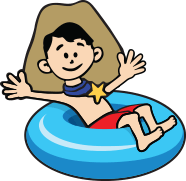 Should you experience any issue using the inner tubes provided, please ask a lifeguard about our cresent-shaped inner tubes. Personal flotation devices may be brought in for infants only. Q: Can I smoke or vape? Smoking and/or vaping is not permitted. Unless it is a service animal, pets are not permitted. Q: Do you offer Season Passes? Yes, season passes may be purchased at the ticket booth.